On February 9, 2016, the Centre for Evidence Based Library and Information Practice hosted Ry Moran, Director of the National Centre for Truth and Reconciliation (NCTR) for the Dean’s Research Lecture . Over the past few years, I’ve followed the Truth and Reconciliation Commission, but hadn’t really thought about what reconciliation meant to me. Ry’s lecture pulled some threads together that hit home, both professionally and personally. It felt like a punch to the gut, a personal call to action that I had to record. Before I was a librarian, I was a historian. And I remember the last time I felt violated by the horrors humans inflict on each other. I also remember how far away those people and situations felt, and how relieved and privileged I felt to grow up in the time and the country I did, where I didn’t have to worry about institutions or individuals that went out of their way to make anyone “less than”. Once I decided to study history, after a brief foray into early Canadian history, I focused on nineteenth & twentieth-century Europe. A course in European capitals of modernity found me in Berlin the same month the Memorial to the Murdered Jews of Europe opened. 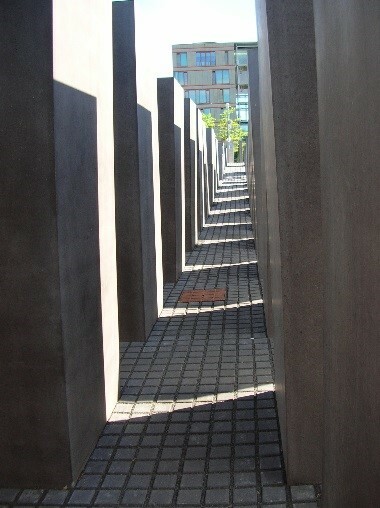 An image from the interior of the Memorial, looking out. It struck me then, and continues to now, the physical scars on the city of Berlin (and across Europe), and the mostly invisible scars on the people – scars imposed within a decade or so. Thinking about reconciliation in my own country has me right back in the thick of primary source research as documents from East Germany were released, and new information about the Holocaust came to light. A fuller version of history has been assembled from these primary source documents, survivor testimonials, and other sources. Much as these sources have contributed to healing in other countries, I hope we will be able to do the same. As the NCTR examines and figures out how to release the documentary evidence they’ve gathered, I hope we will, in the future, live in a country that has accepted its history. And that kids learn about it in elementary school, and researchers in all disciplines add to the conversation and as a country, we move towards reconciliation. I grew up and went to school less than 60 kilometers from the last Residential School in operation in Canada (Lebret, in Fort Qu’Appelle, Saskatchewan). And I didn’t realize it was there. I went through the public school system in Saskatchewan, the province that had the most Residential Schools in operation, and learned nothing about them. I studied Treaties and the making of this nation in my post-secondary education, and still nothing was discussed about Residential Schools. Today, it clicked for me. I’ve studied and researched oppression and systematic attempts to eradicate culture and religion, and felt deeply those injustices. I have stood in memorials, in my own country and others, to people I never met, who died in conflicts that happened long before I was born, and felt their stories speak to me. I’m so grateful to those who fought very hard to bring to light what’s happened in my own country in our recent memory, and begun to take us down a path to reconciliation. I’m proud to work at a University that is now an official partner of the NCTR , and will be looking for ways to bring my curiosity as a researcher, but also as a citizen of Canada, to how I can make reconciliation. In the face of the bravery of the survivors of Residential Schools, how can I not be brave enough to face my own ignorance and take the gift being offered to me, to learn. I look forward to continuing my learning, and am starting with the 10 Principles of Reconciliation (see pages 3&4), and the 94 Calls to Action. Where will you begin your journey to reconciliation?